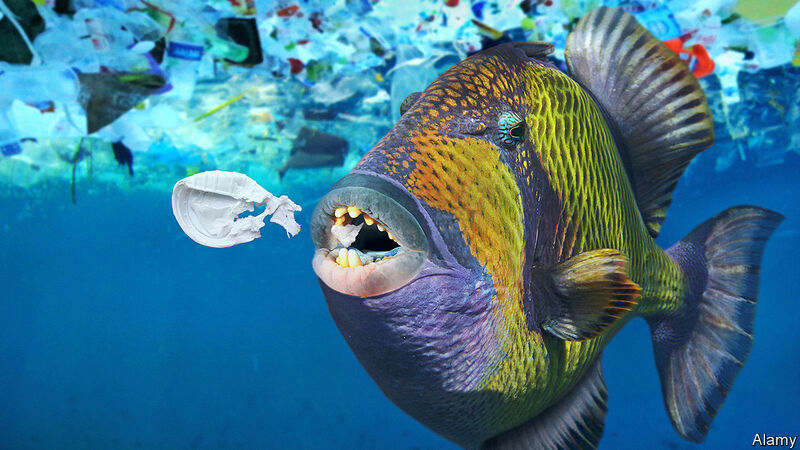 PLASTIC DEBRIS IN the ocean has surfaced recently as a prominent environmental concern. Other pollution takes a greater toll on the seas—fertiliser run-off can cause damage worth $200bn-800bn a year, compared with $13bn for marine plastic litter, according to one estimate. Yet palpable, garish plastics nevertheless attract the most attention. Rich-world television audiences gasp at harrowing images of sea creatures ensnared in disposable bags. Citizens of poor but pretty places worry that rubbish washed up on once-pristine beaches puts off wealthy sun-seekers. The best solution is better rubbish collection in Asia. Just ten countries, eight of them Asian, spew two-thirds of all marine plastic litter originating on land (ships shed some, too, particularly old nets). Fully 90% of the stuff discharged by waterways comes from ten rivers, two in Africa and the rest in Asia. Around 1.5m tonnes of plastic flows down the Yangzi river in China each year, compared with 18 tonnes from the Thames. Scooping all this up will be hard. In Hvaler, a small shrimp port 110km south of the Norwegian capital, Oslo, Hans Olaf, a craggy-faced skipper, remembers when he had to pay the local waste-management company to take away rubbish he caught in his nets. Most people just dumped it overboard instead, he says. Last year Hvaler was chosen as one of a dozen Norwegian harbours piloting a programme to make it simpler to discard trash in port than at sea. The garbage, mainly old fishing gear, is collected free by a Latvian firm which converts it into new nets. “Fishing for litter” schemes exist in a number of North Sea fishing nations, including Scotland, England and the Netherlands. A government-sponsored one in the Indian state of Kerala has hauled in more than 65 tonnes of plastic waste since its launch last year. The material is shredded into plastic chips, which local construction firms buy to strengthen asphalt. In March the port authority in Oslo approved a plan to clean up the litter from the Oslo fjord. To pinpoint underwater islands of rubbish, it turned to Blueye, a marine-technology firm based in Trondheim. Blueye has devised an underwater drone, tethered to a battery unit, which can be used for all manner of subsea inspection down to a depth of 150 metres. Its drones are considerably cheaper—and safer—than sending human divers or larger submersibles, so dozens can be deployed. A trial this spring showed promise. Next year an electric-powered ship with a crane will join the drone fleet to salvage the sunken trash. Another scheme is The Ocean Cleanup, a Dutch charity backed by crowdfunders, deep-pocketed endowments and tech tycoons like Peter Thiel. It has designed a system to trawl for plastic in the vast mid-ocean gyres where currents funnel all manner of flotsam. It is huge: a drifting bow-shaped boom 600 metres long with a three-metre skirt dangling underneath. Because it is propelled by wind and waves, as well as the current, it outpaces the plastic detritus that is driven solely by the ocean. It therefore scoops up the litter as it moves. After successful trials in the North Sea, the first full-size stage sailed from San Francisco on September 8th towards the Alaska-sized patch of garbage in the middle of the north Pacific. Boyan Slat, The Ocean Cleanup’s boss, believes that, once fully deployed in 2020, 60 such contraptions, costing $6m apiece, can mop up about 40,000 tonnes of plastic, around half of the total, within five years. He thinks that corporate sponsors will help foot the bill. Anchors aweigh.